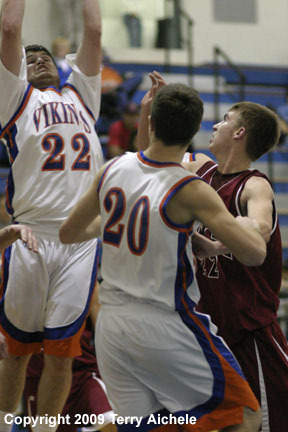 UMATILLA - The Umatilla Vikings dominated the MacHi Pioneers in a non-conference game played Tuesday, January 13, 2009 with a 67-28 win. 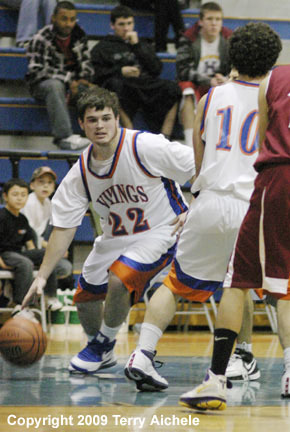 The Vikings dominated the Pioneers in the first half, holding the Pioneers to nine points for the first half. MacHi never lead at any point of the game. MacHi would try to setup plays and control the ball just to have Vikings steal the ball and score on a fast break. While the teams may have been equivalent in size the Vikings had the speed. 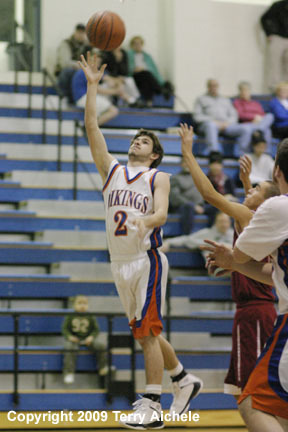 Levi Russell opened the first period hitting a three pointer for the Vikings. The Vikings that started off the game with hot shooting included Steve Williams, Ruben Navarrete, Kasey Pankey and Austin Bieren. The Vikings held MacHi to just two points for the whole second period. Both came on foul shots from different players. 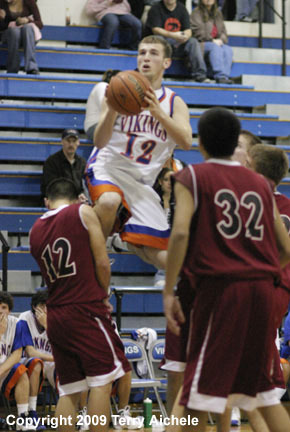 Vikings who hit the basket in the second included Nathan Creason, Levi Russell, Navarrete, and Williams. Umatilla lead at halftime 38-9. MacHi was able to start making hoops in the third period. The Pioneers made eight compared to Umatilla's seven in the third. Vikings lead 45-17 at the end of the third. 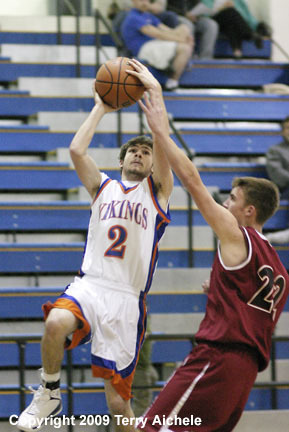 LEFT - Steve Williams of Umatilla drives in for the layup. 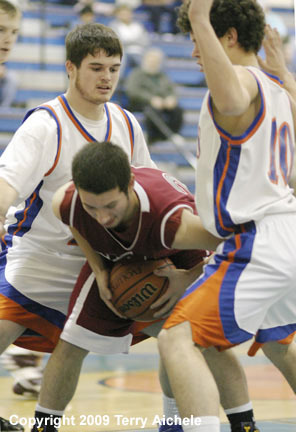 RIGHT - A MacHi defender grabs the rebound in between two Umatilla defenders. 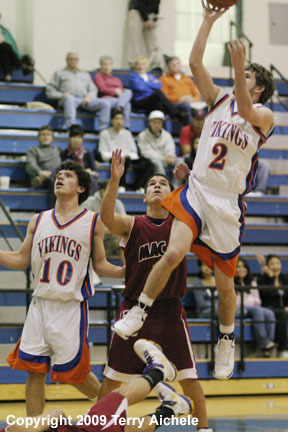 LEFT - Nathan Creason, number 22, goes up for a shot while surrounded by a MacHi defender and teammate Lee Bursell. 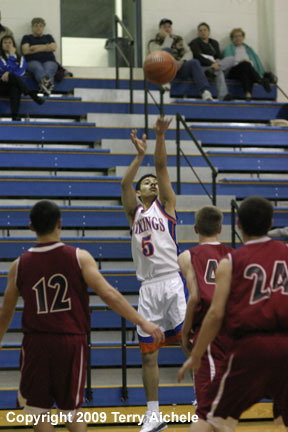 RIGHT - Ruben Navarrete of Umatilla takes a jumps shot. 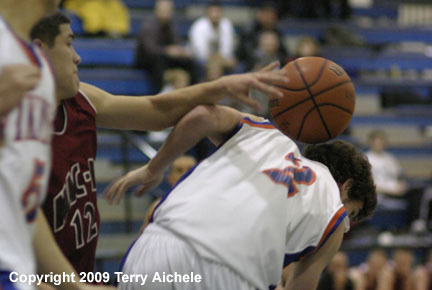 LEFT - Umatilla's Steve Miller has a ball roll over his back when a MacHi defender misses a rebound. RIGHT - Nathan Creason of Umatilla makes his away around teammate Peter Stice.